There will be a new look ALA website due in a week or so. 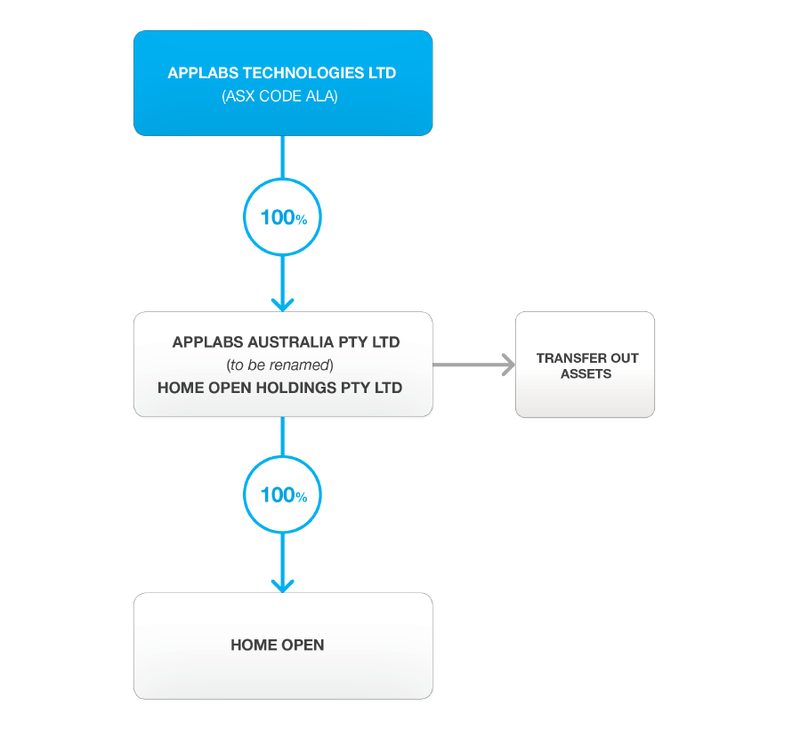  ALA has taken positions in ASX shell companies, with a view to transferring their otherwise off market investments onto the ASX. This will allow see through value to be recognised in the investments and give the investments all important liquidity. ALA is still a small company and is a high risk investment – they have many promising arms to their business but there are no guarantees in the world of tech investing. To make sure we understand what we are investing in, we like to do our homework and we’re sure you do too. So in the next section let’s get stuck into all of the cool catalysts ALA have been delivering and setting up. Since we released the Next Small Cap article on ASX:SEG, Sirius went from 5c to $5... New Upstart Explorer Has More Land, More Drilling Targets , SEG has risen as high as 220% since. Some very interesting times for Home Open, and hopefully just the start of what is to come. ALA have also launched the Home Open website, www.homeopen.com . Click that link or type that into your net browser and have a gander at the website that supports ALA’s big ticket portal. In case you haven’t seen it before, Home Open is a new portal that ALA is aiming to use to revolutionise Australia’s huge and very lucrative real estate listings market. 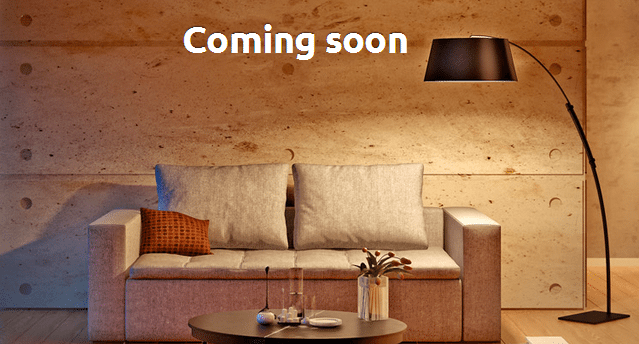 With the launch of this website by ALA Home Open is now available for use to the full spectrum of electronic devices – from an Apple smart phone to an Android tablet to a Dell desktop PC. The website launch is the final move in ALA’s stage one of the tech development for Home Open, and the team will now switch its focus to ramping everything else up for the launch of the portal to consumers. In other Home Open news, the app cracked the top 20 most downloaded apps in the Apple app store with a five star rating! This came after its soft industry launch at the AREC conference – Australia’s biggest real estate industry event. 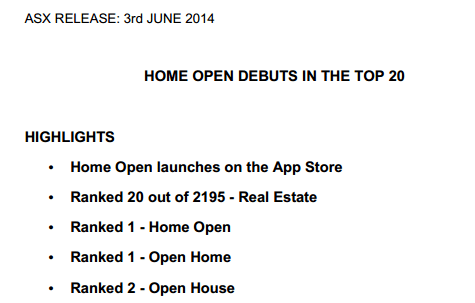 The buzz is building, especially as the number of real estate agents and people registering to use Home Open is growing. Some of Australia’s largest real estate firms – including First National, Ray White, The Professionals and Raine and Horne – have signed up selected offices from their combined 2000+ franchises across Australia. The greatest adoption of the app has been in Western Australia and ALA says it will place particular focus on that state to maximise sign ups before the product’s consumer launch – which should take place later this year. 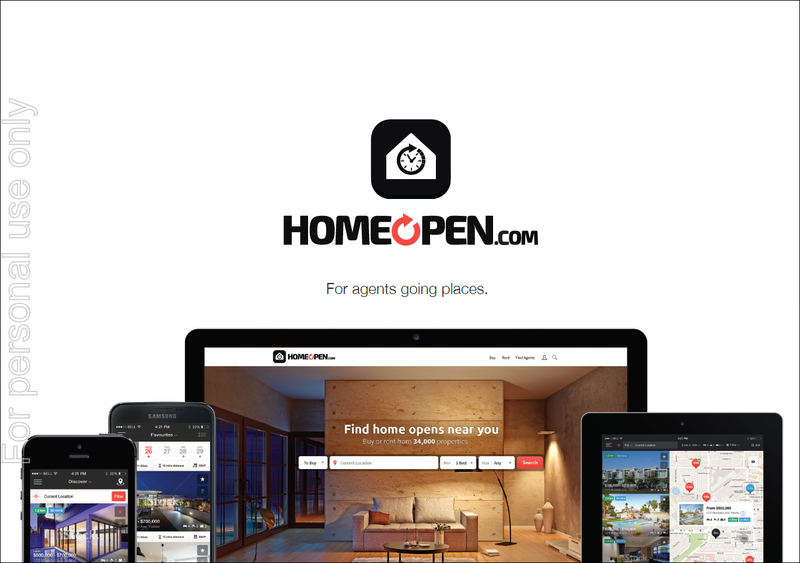 Home Open is a new real estate portal that anyone looking for a home to rent or buy can download onto their smart phone, tablet or computer and use to find the place of their dreams. It can be used by punters and real estate agents alike. For punters, Home Open lists thousands of homes that are for sale or rent and lets them pick and choose which ones they want to see. Then Home Open does the rest. It organises their choices into an efficient list – when they are open and what order they should be seen in most effectively – and even uses Google Maps to provide them with a plan of attack! Once they are at the house, Home Open can really kick into overdrive. Using iBeacon technology which allows information to de displayed in real time on a user’s app, Home Open can engage people in real time as they move through the property – pointing out features and explaining their benefits. No other real estate app in Australia has these features. Nothing even close. Roster Elf is an app that’s designed to make scheduling work easier. No more paper spreadsheets and erasers to rub out last minute changes. Just log onto Roster Elf, create an account and start rostering. The online Roster Elf makes it easy to roster employees, as it can be updated in real time and seen by everyone in a company. It’s cloud based – so no more tacking up a sheet on the bulletin board. Log on and use your smart phone to see when you’re working next. Simple – and it’s starting to catch on like wild fire. ALA has a 25% stake in the app and since its launch onto the market back in July, Roster Elf has gone from strength to strength . A full marketing campaign using Search Engine Optimisation, Google Adwords and social media is underway to win over users and businesses. To date there are 70 companies using the Roster Elf app representing hospitality, retail, call centres, security and transport, and that number is rising steadily. 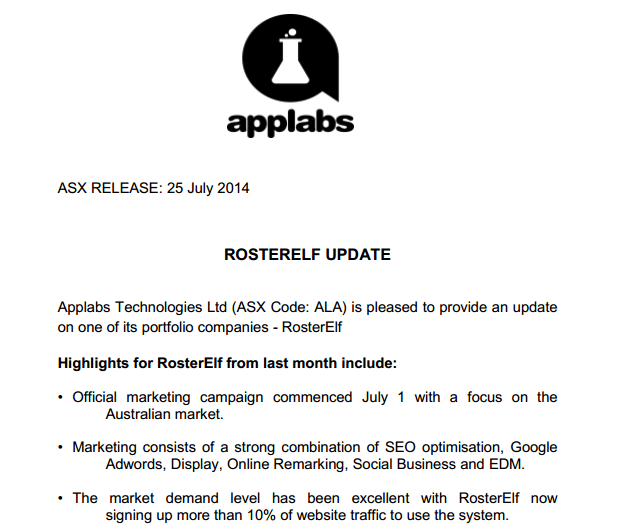 In its latest update on Roster Elf, ALA says more than 10% of the app’s website’s traffic is from sign ups to use the app – a great result – and the cost per conversion rate is dropping steadily as the Roster Elf team optimises its marketing campaigns. A customer contact centre has been set up in Manila and an Affiliate Agreement has been signed with the recruitment firm PLUS 8 which should result in more hospitality clients signing on. Now Roster Elf is underway, the team there are planning to target a USA launch of the product and get onto that massive market. That’s slated for Q1 of 2015 and planning is currently underway. Now, to take Roster Elf to the next level it needs to be optimised and ALA is set to take an even bigger role within Roster Elf to make that happen. We often say ALA is a triple-attack business, meaning it makes its own apps, apps for contract, and invests in app ideas. It can make money three ways from these different app-related methods. Well, ALA is about to combine two of its skills – investing and developing – at Roster Elf. It’s just been hired to develop three mobile phone applications for Roster Elf to expand upon its current web-based product. Just one killer app can make millions if not billions of dollars. The global industry is worth $68BN and tipped to rise to over $140BN by 2016. With that in mind, ALA has signed a partnership agreement with Archimedes Labs , a leading Silicon Valley tech incubator and investor, to jointly collaborate and co-invest in technology start ups. Silicon Valley. Ground zero for tech giants like Facebook and Google and where you’ll find Keith Teare and Kambiz Hooshmand , two of the biggest names in the Silicon Valley tech world who are the brains behind Archimedes Labs. Keith Teare created EasyNet and RealNames – together worth over $1BN. Teare and Hooshmand together created TechCrunch, a news website all about technology that was acquired by AOL for an undisclosed (though likely very large) figure. Archimedes Labs amasses huge amounts of venture capital and injects it into the most promising tech start ups on the planet. The Archimedes Venture 1 Capital Fund returned over 100x times what investors put in, turning $250K into $28M. Archimedes II has an implied IRR of 136% and has already distributed back 93% of investors funds. Right now Archimedes Labs is putting together its third Venture Capital Fund (Archimedes Venture III) worth $25M. And ALA is part of it. ALA can invest in companies at the same pricing and terms as Archimedes III – plus any app or start up investments ALA makes can be picked up on by Archimedes III. When we first wrote about this opportunity for ALA, the company said it was in negotiations with several US based investment opportunities. 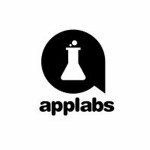 To make the deals ALA has established a USA subsidiary called Applabs Technologies LLC based in Denver, Colorado that can swiftly execute deals on American soil. Well, lots of investments have now been made and ALA has picked up some high potential tech plays. Let’s see what it’s got in the bag: PAY2DAY Solutions Ever wanted to pay a bill via text message? ALA has just invested in PAY2DAY Solutions, acquiring a 4.48% stake in the company with a combination of cash and a stock swap component sealing the deal. PAY2DAY Solutions is developing propriety technology that can be used to pay any bill with an SMS message – making online bill paying easier as well as accessible from anywhere with a mobile phone signal. PAY2DAY Solutions has partnered up with the communications firm Telescope Inc. which manages over 1.5BN SMS interactions every year. 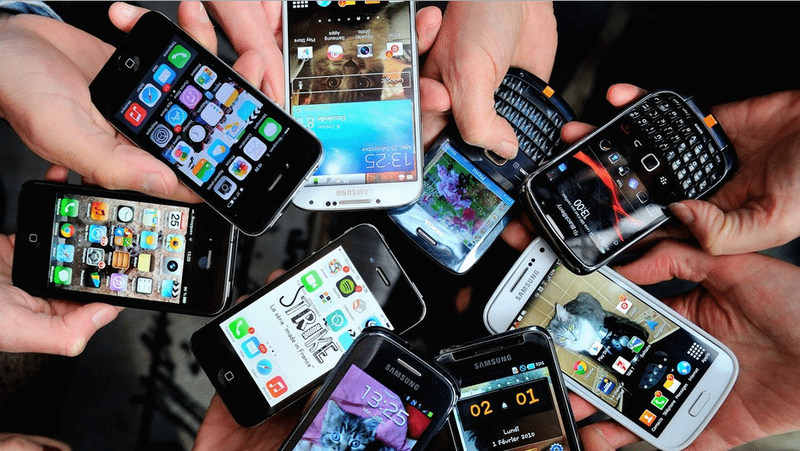 Together, they plan to roll this SMS bill paying technology across the world. And ALA has a 4.48% stake in its success. The blue sky is that billions of people could use this technology and pay PAY2DAY Solutions for the privilege. Smart move ALA. A Google ventures funded chat centre Facebook famously paid $19BN for Whatsapp, a mobile based chat service. What do you reckon it would pay for a chat service that uses any chat app out there to connect its users? ALA has just invested in just.me 2014 inc which is developing an app called Chat Centre. This development work is supported by Google Ventures and ALA is investing US$50,000 into the idea. 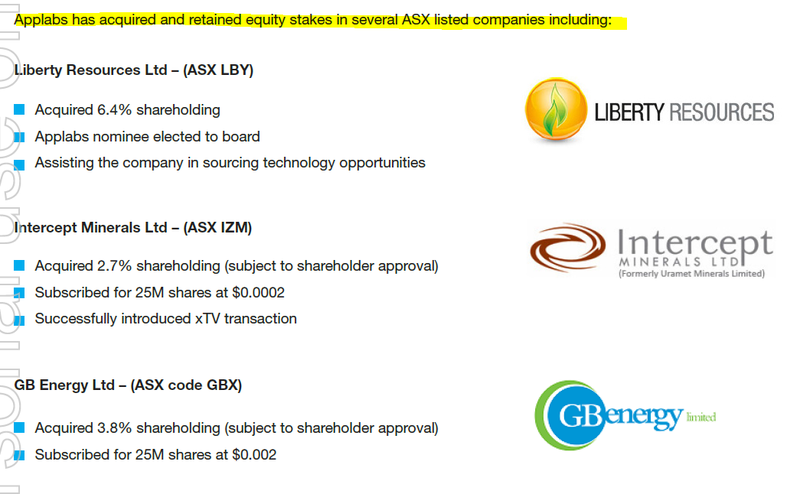 The key takeaway is that ALA’s investment in xTV has gone up on paper value – and when the deal goes through they will hold listed stock instead of unlisted stock in xTV... Nice move ALA! Facial recognition technology ALA has spent $250,000 cash to acquire a 15% stake in a company that’s developing facial recognition device that can used to detect pain in non-communicative people. Known as an Electronic Pain Assessment Tool, this technology is being developed by Electronic Pain Assessment Technologies Ltd (ePAT) with Western Australia’s Curtin University as the major shareholder. The ePAT is billed as the world’s first 3D facial recognition and emotional application for the detection of pain in adults afflicted with a variety of conditions including dementia and Alzheimer’s. The hope is that the ePAT technology can assist doctors and nurses when they treat patients who don’t respond in the regular way and assess whether they are in pain or discomfort. Aside from a great moral imperative, the development of this technology could create a device that can be sold around the world, helping millions of people in the process. ALA thinks up and creates its own apps, invests in hot app ideas and makes apps for others through contracts – what we call a triple-attack business. $460,000 of work on hand and over $550,000 of prospective development contracts. 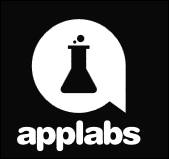 New clients are coming to ALA thick and fast to get the team to build them the next hot app. 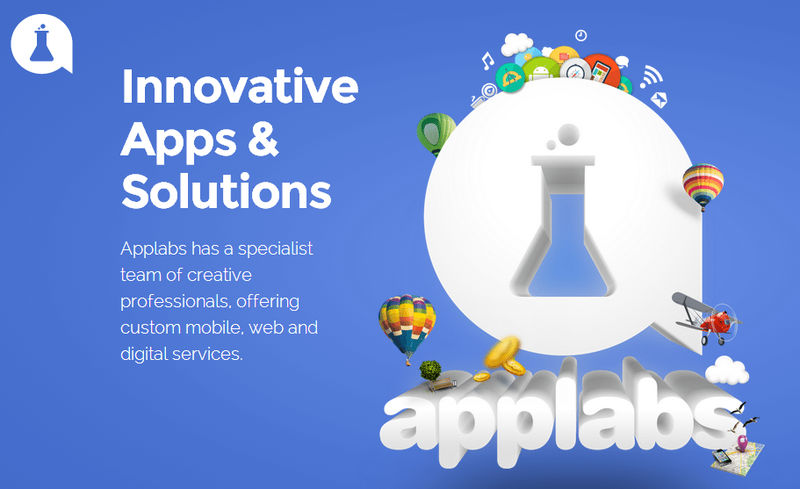 Apps are the tools of the internet these days and to be taken seriously in business and even government you need an app. ALA can build them – for a fee of course – and the record sales of the Fee for Service division show just how much demand there is for ALA’s services. 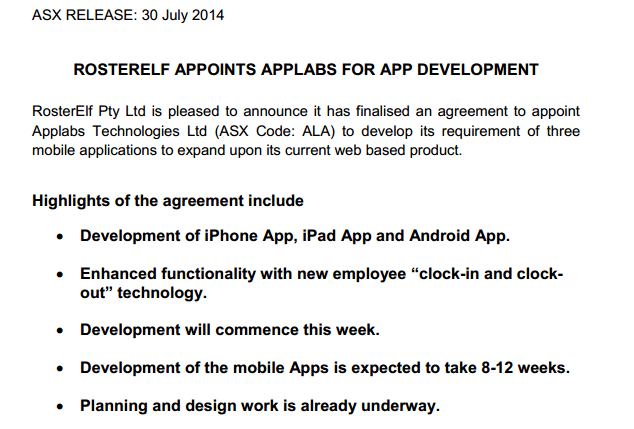 Private enterprises, government departments and even other tech firms are signing contracts with ALA for app work. This is a very encouraging sign for ALA as an app developer – it’s made a solid start to the financial year and is fast making its mark in the tech scene. Outware, a Melbourne based app developer made $5M in revenue in 2013 – reckon ALA could top that? It’s a very long way to go for ALA to reach this kind of revenue, but if the early growth to date is any indication, one day they may well get there. The best part about ALA’s growing contract work is that it’s sensible. While ALA develops its own apps like Home Open and makes all those Silicon Valley startup investments, it is taking care of business and the bottom line. ALA is not a pack of nutty professors locked up in the lab working on some crazy invention. They are slick tech developers and business operators rolled into one – one eye on the bottom line and one on the blue sky. And with the acceleration of Home Open on one hand and record breaking revenues from paid work on the other, it’s fair to say the strategy is working very well indeed. Can we take a breather? No! The tech world moves fast and so does ALA. Home Open is available now across the full spectrum of electronic gadgets – iPhone, iPad, Android and web. It’s cracked the top 20 most downloads in the Apple app store and has a five star rating. We’re looking towards a flurry of signs ups from real estate agents across Australia in the coming months as marketing gets into full swing. With Roster Elf we’ll see iPhone, iPad and Android compatible versions of the app roll out (built by ALA) within three months. It has 70 users and climbing for Roster Elf and we’ll be looking out for a snowball effect as the app gains traction. All of the investments ALA has made through Archimedes III – Chat Centre, PAY2DAY Solutions and xTV look very promising. The xTV deal has increased the paper value of this business and we’ll be looking for development updates from the others as we go along. Who knows what other deals ALA has in the works? Now that is has a US subsidiary to make the signing of papers much faster anything could happen – on and it likely has about $5M still in the bank too... All in all it’s been a very, very busy time for ALA and things show no sign of slowing down. Business contracts are booming, Home Open and Roster Elf are accelerating and its portfolio of investments is getting larger all the time. At the same time, we understand that ALA is still a small company and remains a high risk investment – ALA has a lot of potential, but there are no guarantees in the tech world... To think, all of this comes from apps, digital tools on a smart phone or a computer. It was unthinkable even three years ago but now who knows just how profitable this could all one day be.